Last year when I played nose work games with Luke with treats, he did great, and he really enjoyed it. I had always wanted to go further though and learn true nose works with real scents, not just treats; even if we didn’t ever decide to compete or try to get titles like our friends at MyGBGVLife. Congrats to Emma on getting her 4th Nose Work title recently! I decided what would work best for us would be to take an online class through Fenzi Dog Sports Academy. We signed up for Introduction to Nose Works which started August 1st. We are running about two weeks behind because of things going on, but that is the convenience of the online classes, we can do it at our own pace and on our own time. They have three levels of classes; gold, silver, and bronze and the bronze level which we’re doing is similar to auditing a class. We don’t submit the video homework and we can’t ask questions of the teacher; but we do have access to all of the forums so we can see the other students’ videos and questions, as well as the instructor’s feedback. It has been so much fun and Luke has been moving along quickly. There have been a couple of times I felt like he wasn’t getting it; but as has been typical of any training with him, just when I think he doesn’t get it, the next time we do it he’s right on it. So far he’s been most challenged when we used different containers for the scents (the tin with the scented Q-tips goes inside a plastic container, box, shoe or other item); and when I started elevating the containers from the ground. He’s gotten past both of those things now and we just recently tried adding a mild distracting scent. He has barely “false alerted” at all. We also just tried his first interior search without containers (just a tin with odor) and he aced it! I love this ComfortFlex Sport Harness which is so easy to put on! As far as generalizing on locations, that has not been an issue for him. If he sees the boxes and containers, he knows what it’s all about and he’s right on it. We’ve used different rooms in the house, and we’ve been out on the patio as well and even if he gets distracted by something out there, he comes back to it. I just got him a special harness and leash so we can start trying the garage, barn, and driveway at some point as well. I believe this course only covers interior searches though. The video I’m sharing today shows Luke conducting searches through different ground level containers. Only one container is “hot” meaning it has the scented tin inside it. Right now we treat heavily when he selects the correct container. There are 4 searches in the video. In the first one, I can see where I screwed up a bit by treating him when he took his nose off the container, but you can also see (at about 27 sec) where I hold the treat away from the container – called proofing – and he did not take his nose off to follow it! The second search I think we both got it right, and I made the third one a bit tougher by hiding the hot container next to the toy box. It took him longer but he got there! The final search was an easy one, which is how we always end. The more I do this, the more the idea of competing appeals to me, especially if Luke keeps doing so well. This is a great sport for reactive dogs, though I think I might like to take one of Fenzi’s reactive dog classes before taking that step. We’ll see, trials mean traveling for us as well, so that would be a big factor. In the meantime, the point for him is to build his confidence, and to have some fun. Our class has technically ended, but we still have about two weeks’ worth of lessons to go through. The school saves them in a “library” for us so we have access for a year. We’ll have another progress report at some point, and I’d say we definitely plan on moving on to the second class at some point. For anyone that is considering trying this, I highly recommend it. Luke gets so excited when he knows we’re going to practice. It’s the ultimate in Positive Reinforcement training, I think. They really can’t do anything “wrong”, making it a totally positive experience. We are supposed to limit the times we spend on each session but I often find myself doing just a little more…..simply because we’re having so much fun! We are joining the Positive Pet Reinforcement hop this week. It begins on the first Monday of every month and runs all week long. The hop is hosted by Cascadian Nomads, Tenacious Little Terrier, and Rubicon Days. I love how happy he looked when he came into the room. It sure looks like nose work is helping his confidence. I’m glad you found something that works. Isn’t dog sports kind of addicting? I wish I was still doing it with Delilah. That is excellent. Luke did a very nice job! I’m so happy to see all of these posts mention Fenzi Academy! I absolutely love the classes there and think so many people and dogs would benefit from it. You’re doing a great job with Luke! Nose work is such a fun and easy sport for both the dogs and owners. You learn so much about body language and training just by teaching it as well. It’s also quite possibly one of the best and most lifesaving things in existence for energetic dogs in the dead of winter. Keep up the good work! Thank you, Alix! This was my first class with Fenzi, and it was so great. They have so many classes I want to take too, I don’t think I’ll ever have time for them all! This will definitely give us something to work on in the winter. I’ve started it with our older beagle too. She’s 12 and her arthritis has been getting worse so it is great to give her something low key to do. She’s not picking it up quite as quick as Luke did, but she’s having fun too and that’s what’s important to me. Oh I was so happy to see this post! We’re Nosework fanatics and we’re actually in our first NW1 trial this coming Saturday so I’m freaking out. One of the things we do to practice containers inside is with pizza boxes! You may have already done this but since you’re doing interior searches you could mix it up with boxes – I went to our local pizza place and asked for about 15 small boxes and they ended up giving them to me for free. Then the odor box I just poke some holes into and then I always pair. Fenzi classed are super popular with my friends here in Oregon!! Love that you all are loving these!! Oh, that’s so exciting that you’re going for your first trial – good luck! If I ever decide to do that, I know I’ll be a nervous wreck. 🙂 Let us know how you make out! We have added some boxes to our searches, but I don’t have any that are a consistent shape/size which might be better. Great idea about the pizza boxes! Luke looks like he is thoroughly enjoying it. I would love to do this with my Huskies, as they love to “work.” I never knew you could take an online class for this! Very cool! It’s not only convenient to do it at our own pace, but it makes it easy to work with more than one dog. Sheba didn’t take to it very well, so what if I had taken a physical class with her only to find that out? This way I could work with each dog to see if they liked it or not (our beagle Cricket is behind Luke but coming along now too). I’ve been wanting to do nose work with Ducky, but something has always gotten in the way and distracted me. Now with the Vet Assistant course taking up so much time, I’ve put a lot of “stuff” on hold. Looks like Luke is having a great time! And I bet it’s building his self-confidence, too. We can only do so much, right? I kept putting this class off waiting for the perfect time and finally decided to just do it. But taking two courses at once would be too much for me! Luke is definitely having fun with this (and so am I) and I sure hope it’s helping his confidence as well. Wow – I hadn’t realized you could do an online nose work class! I should try that with Rita. I just looked up nose work classes here the other day, and it said no dogs who are possibly reactive to people humans could take the class… and since Rita can be reactive to strange, tall men in hats I figured I better not sign her up. Online could be the answer! As for an online reactivity class – wow, I had no idea about that either! Gotta look into that! Definitely check out Fenzi, Jackie, they have such a great variety of courses and I think the prices for the basic courses ($65) is really reasonable. It was my understanding that nose works was a good sport for reactive dogs; so I’m surprised your local one doesn’t allow them. Though I’m sure every place may have different rules and ways of conducting their classes. Dang Luke, that’s pretty darn impressive and it’s very cool that the course was online! That is terrific. You do such an amazing job with Luke. ♥ I’m sure that he’d enjoy competing. I worry about him with a lot of strangers around, but then again, he gets really focused on what he’s doing, and doesn’t even usually get distracted by me! So glad you found something for you and Luke to do. Thanks for the pic monkey tip yesterday, I use pic monkey but didn’t know how to use that feature. I think Sugar the Golden Retriever did a little tutorial on it once, and that was how I learned about it. Glad I could help! Way to go, Luke! I haven’t moved my dogs past pairing the scent with treats, because neither of them actually alerts when they find it. Although, once I forgot to put the treat on the tin and Leo did look at me like, “Excuse me. I smell birch, but there’s no treat here.” So, I guess that’s his alert. LOL…whatever works, right? The class I took does it a bit differently. There is no pairing, just the scent and rewards when they find it and keep their nose on it. Glad Luke is liking the class. We took that class too and liked it. I prefer the working odor right away method. Maybe we can take the reactive management dog class together. Thanks for joining the hop! I like that method too. Since I had already played with Luke and just treats in the past, I wanted to get right to learning scents, so this worked well for us. That would be fun to take that class together! I don’t think I knew – or I forgot – that you had done nose work too, Dolly. I hope you get back to it as well. I’m so glad that I heard about the online classes. We have some classes locally, but it’s still a 40 minute drive to get there and just not very convenient for us. This works out perfectly. You two have a great Mom!! I’m glad that he’s having such a good time with it! When we moved to exterior searches, we started the same way we’d started inside–simple, with just one or two boxes–and then gradually increased the difficulty. Barley didn’t need much time with the early stages outside because as soon as she saw the boxes, she knew what was happening, so we were moving on to just hiding her scent somewhere without boxes very quickly. It sounds like Luke’s probably the same 🙂 We get our supplies from the same sight as Emma does! It’s funny because at first I wondered “is he really catching on? Maybe he’s just smelling the treats I’m dropping on the container or something”. It’s so fun when you realize that they really get it. I have a feeling moving outside will be a quick adjustment too. I even see him remembering stuff from when we did nose work games last year. I continue to use the command “find it” because that’s what I used then. He quickly searches a whole room, not just the containers, and I know that’s because he remembers doing that when I hid treats around – and that was at the old house! He is doing awesome! Great harness too. A lot of our friends use those. You should put it on anytime he is doing nose work, so he associates the harness with work. 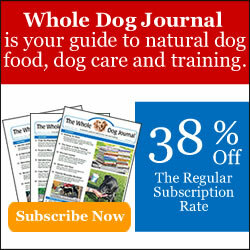 If you need any supplies http://www.thek9nose.com/ is where we get our stuff. They are great, and as for leashes for nose work, we love the palamino lines 3/8 or 1/2 inch and ours are 10ft for nose work. We use them for tracking too. Once you place the order, they arrive in just a few days. http://www.palominelines.com/id47.html So happy to hear he loves it and he is doing so well! Thank you! I’m trying to remember to put the harness on him every time even if we’re just in the house. I will check out that website for sure. I already ordered a leash that is biothane, I think that might be similar to the palamino, and I did get the 10 foot. Thank you so much for encouraging us to do this!